Published: Jan. 5, 2014 at 09:44 a.m. 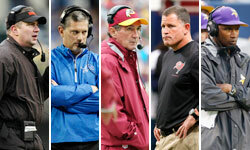 Updated: Jan. 5, 2014 at 04:41 p.m.
With five teams still mining for a new head coach, Ken Whisenhunt's name is picking up steam. NFL Media Insider Ian Rapoport reported Sunday on NFL Network's "GameDay Morning" that the Detroit Lions view the offensive coordinator of the San Diego Chargers as a top candidate. They aren't alone, according to sources informed of those searches. The Washington Redskins and Minnesota Vikings have shown interest, and the Tennessee Titans -- who fired Mike Munchak on Saturday -- are creeping around, too. Let's go back to the Lions: After Detroit missed out on interviewing a pair of coaches they coveted in Lovie Smith and Bill O'Brien, Rapoport expects the team to meet with Whiz this week, depending on his schedule and where the Chargers stand after Sunday. Why is Whisenhunt so popular? Rapoport was told that he's viewed as a steady, proven coach who can work wonders under center. Finding the best possible tutor for Matthew Stafford and Robert Griffin III looms as a top priority for those team. In Tennessee, Jake Locker's future is up in the air, and it's possible that Minnesota's next coach could sweep that quarterback room clean. Whisenhunt has helped revive Philip Rivers, but interested teams would be wise to ponder what happened during his stint as coach of the Cardinals. Arizona, post-Kurt Warner, was crippled by a clown car of underperforming passers who all but sunk that team and led to Whiz's firing. We previewed all four wild-card games in the latest "Around The League Podcast."